Today’s post is part of a new series called “Meet the Omnia Team,” in which we interview some of our colleagues. We’re starting with Esther de Winter, our Marketing Manager, communications queen, and in-house Nutella expert. 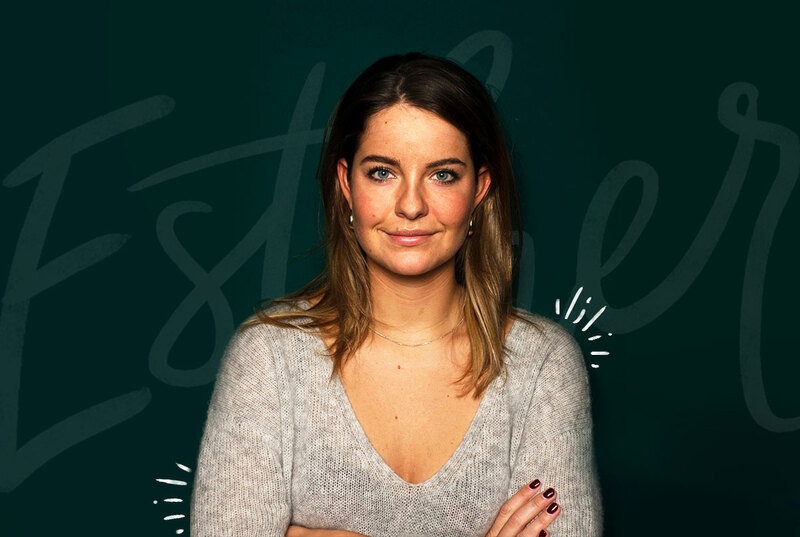 Esther’s presence is unmistakable in the office, and in between meetings you’ll find her chatting around the coffee machine or tapping away on her keyboard making sure all things Marketing are done smoothly. We sat down with her and asked her about her life at Omnia, what she loves about the job, and what her plans are for marketing at Omnia. Can you introduce yourself a bit? Sure! My name’s Esther, and I’m the Marketing Manager at Omnia. I’m responsible for developing the company’s marketing strategy. More specifically, that means attracting potential customers to Omnia through content and advertising, events, public relations, and more. I’m also the main contact point for our outward communications with the outside world. How did you get into marketing? What drew you to the profession? I’ve always been interested in people and what makes all of us “tick,” so when it was time for me to go to university I pursued a Bachelor’s degree in psychology. I was especially interested in neuropsychology and the scientific side of the field, so I specialized in this sector. During that course of study though, I discovered the social side of the psychology equation. It fascinated me and kept taking courses in the field. Around the same time I decided I didn’t want to go into clinical psychology, and instead I pursued a Master’s degree in Economic and Consumer Psychology. By the end of my Master’s, I realized that marketing was a logical choice for me. I’d studied it at school and found that the industry was a natural fit for my personality and interests. How did you end up at Omnia? I started out my career with an internship at a German corporate, and while I liked the work, I realized that the traditional corporate life just wasn’t really for me. After the internship, I worked at Uber as a part of their Community Support team, supporting the company as they launched UberEATS in Amsterdam. It was there that I learned more about tech companies, and I became particularly interested in SaaS as a business model. I eventually moved over to StudyTube, a SaaS solution in the e-learning industry, and helped them set up Hubspot and build their inbound marketing model. At the time, a friend of mine worked at Omnia and he knew what I was doing at StudyTube. Omnia was looking to increase their marketing efforts, so he asked me to sit down with himself and Sander (Omnia’s CEO and founder) to talk about Hubspot and marketing in general. After that meeting, Sander called and asked me to join the company for a two-month implementation period of Hubspot. I joined, and after two months I realized that Omnia was a great fit for me. So I stayed on as the first marketer! What’s been your key to success? Success is way too big a word! I think I was very lucky to find something I enjoy doing while also being able to work with, and learn from, some pretty inspiring people. Those two things combined give me a ton of energy to bring into work every day, and I think that’s something that makes a difference. What’s your vision for Omnia’s marketing? In the short term, we’re focusing heavily on SEO as a channel because there’s a ton of room for growth. We are also exploring how we can increasingly include video in our marketing efforts, improve our conversion rates, and continue to build out our inbound marketing strategy. So you can expect to see some awesome content pieces this year, including some fun videos, webinars, original industry research, and more. On the more long-term end of the spectrum, the goal is for Omnia to be the thought leader in everything to do with retail and e-commerce. We have an incredible amount of knowledge about retail in-house, and I’m truly excited about sharing that expertise with the outside world. You manage quite a lot of projects, including content, design, campaign management, events, PR, and more. How would you characterize your leadership style? I think my leadership style is more friendly than managerial. I like to think of my teammates as colleagues, not as people I need to manage. And since we hire for expertise at Omnia, I place a lot of trust in the members of the marketing team to do what needs to get done. There needs to be someone setting goals and keeping oversight, but I’m a firm believer in creating a collaborative team where everyone involved feels satisfied with their role and the results we achieve together. Nothing makes me happier than seeing my team members becoming as enthusiastic about projects and results as I am. What do you look for in new teammates? Who do you think will succeed on your team? Personally, I look more for a cultural fit than someone who is perfect on paper. I figure that the world is changing so rapidly, we all need to continue learning and growing anyway. That‘s why I‘d rather have someone on my team who I can work effectively with and have fun with while we continue to grow together. What do you like most about working at Omnia? There’s tons of room to grow here, which I think is amazing. In the two years I’ve been with the company, we’ve gone through some explosive growth, and it’s cool to see how the company changes with each new step. From our tiny office in Naarden with only handful of people to our beautiful new space in Amsterdam with a team of 35 we’ve started to build something extraordinary. Additionally, no two days are the same at Omnia so I constantly feel stimulated and challenged. There’s lots of work to do, of course, but it’s exciting and interesting. There’s a lot of freedom for new ideas, so I’ve been able to propose and take charge of some incredible projects like building our inbound marketing strategy and defining our value proposition, which has helped establish the company in the market. More recently I helped spearhead Omnia Reinvent, which is our annual customer event, and currently we are redesigning our website for a second time. What makes me most excited to come into work everyday though, is the team. We have a great group of people working here at Omnia. Being able to collaborate with people who are not only incredibly smart but also a lot of fun makes coming into the office everyday feel like a breeze. Now for the fun part. What do you like to do outside of work? To be honest, I really love spending time with my friends! I love to go explore the city with them, looking for new restaurants to try and places to visit. I also enjoy traveling and try to do one or two larger trips a year. I was in Mexico and the Philippines with my friends in 2018 and I just planned my next trip in May. In between seeing my friends and traveling, I’m also a bit of a sports addict. After a hard day of work, nothing is more relaxing to me than a workout. My less standard interests are that I really enjoy art and visiting museums, and that I’m passionate about interior design.